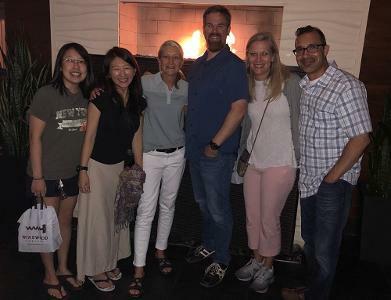 Just returned from a trip to the beautiful bay area in Oakland, with gracious hosts Tim Appleford and Naomi Schambelan at Lafayette Physical Therapy. Thank you so much Tim, Naomi and your team for working through unpredictable variables to allow what turned out to be a tremendous course! 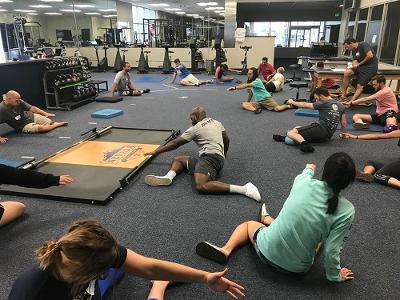 From the start, this crowd of diverse movement scientists from a variety of professions proved they were dialed into the science of PRI and Pelvis Restoration. We had a series of great discussions regarding the theory, science and rationale for why frontal plane control of the inlet and outlet of the pelvis is important for integrating a triplanar system together and developing patterns to oppose one of three categories of patterns that often lead clients to us in our varied settings. 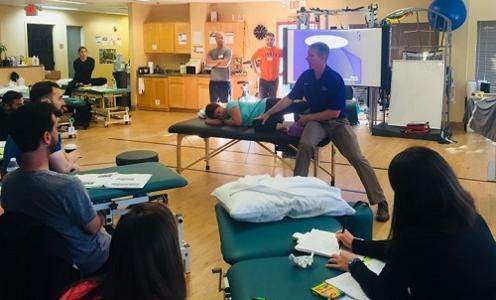 Our lab demonstration and interactive discussion about eight special tests to assess pelvis position and specific need for intervention was a joy for this instructor and for our ace lab assistant, Taylor Lewis. Sam Eisenberg, George Cuevas, Naomi Schambelan, Drew Yoder, Shuan Buchanan and Sura Choi among others were champs, helping with lab demonstrations of special tests and with demonstrations of how and when to utilize PRI techniques in designing individualized programs. I appreciated John Ursone, Marisa Gulizia and others for your on-point questions about PRI the science, particularly with regard to application. Thank you Robert “Luceeeente,” Crystal Palmer and really the whole gang for your senses of humor and keeping the positive flow throughout the course. Thanks again Lafayette crew. 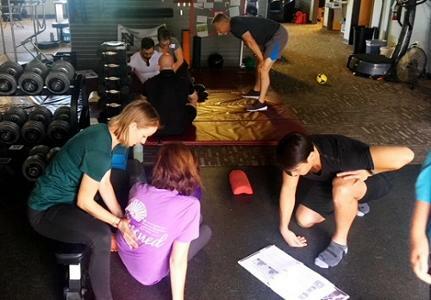 This weekend was a celebration of learners and functional movement science—what a blast! Engaging into discussions regarding right lateral superior and posterior inferior chest wall expansion is so rewarding when the engagers truly want to understand the reasoning behind the intent and the outcomes purpose. Regardless how we feel about internal physiologic or physical movement of our anatomy, we all stay alive through compression and decompression. This course reviews the neuro-mechanical patterns of basic diaphragmatic decompression, i.e. expansion, and corresponding direction of compressive forces, i.e. abdominals and body position. 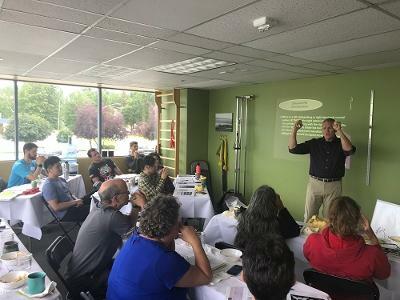 Having 50 engaged class participants from seven different areas of study, allowed all of us to compress and decompress not only in the lab setting, but during questions and answer sessions, that were as valuable, in my opinion as the material in the power point and in the manual. 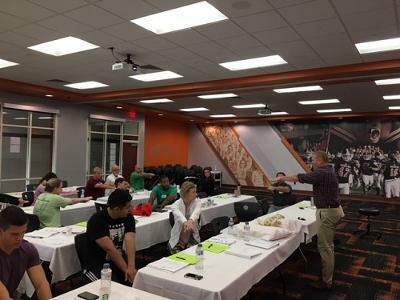 Joseph Turic DPT, Aleena Kanner ATC, NASM, Beth Lewis and many others in the lab setting were so helpful in expanding minds, behavior and concepts. Navin Hettiarachchi ATC, Dip MT, MCMT, ATC, PRT, CSCS and Sean Light MS, RSCC, LMT, CS, PRT, as lab assistants, expand anyone or everyone that gets close to them with their smiles alone. It was so wonderful to have Gail Wetzler DPT, EDO, BI-D, a very prominent Barral Institute instructor, in attendance. I am so grateful for the opportunity to get to know her better. We were scheduled last year to present in Puerto Rico at the AAPMD conference, before Maria hit. Please read my tweet on how people like her expand my moral compass. Finally, I want to thank all the wonderful people at Finish Line Physical Therapy. 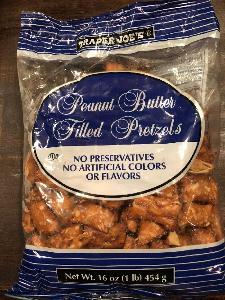 They not only allow us to expand PRI in the New York City region, again, but actually took part in expanding this course by reviewing their lab discoveries, and by expanding my stomach through feeding me the peanut butter filled pretzels! These have become a Finish Line staple of expansion. Thank you. 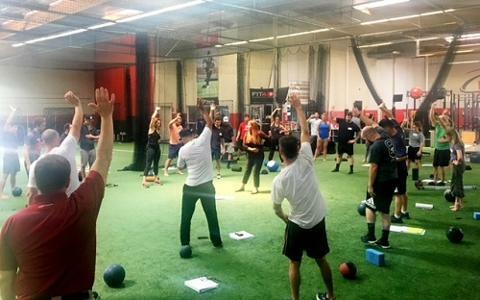 The Impingement and Instability PRI Course is one of my favorite courses to relate PRI concepts with actual course attendee’s multiple interests and perspectives. It is also a wonderful course to establish relationships through similar mindsets and settings. The University of Arizona host site is a perfect place for this type of activity to take place. There were a number of people with different perspectives, interests and mindsets to make this course so beneficial for everyone in attendance, as well as, to appreciate reference integration reasoning from different pre- designed perspectives and pre-established relationships. Brittany Cline PT, DPT,ATC , Bruce Johnston ATC and the other University of Arizona host site attendees were and are so hospitable. I enjoyed having Brittany’s 3 month old son, Jackson, in the course. He attended both days and is sensing his right lateral chest and demonstrating to the class how to sense and use this reference center in one of the attached pictures. I am quite sure Jackson is the youngest course attendee I have ever had, and for the most part was all smiles both days. Victoria Humphrey PT, Samantha Yeoman ATC, and Nathanael Smith ATC, CSCS, thank you for being such willing class models. The weather was warm outside but everyone was so cool inside. 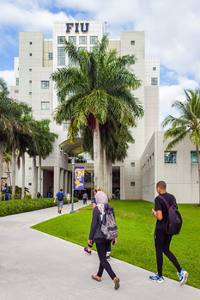 I really enjoyed walking around this beautiful campus and hope that someday this host site will become a Postural Restoration Certified Center. I can understand how James Anderson MPT,PRC loves these people, loves the facility and loves the food; even though Café Poca Cosa was closed for the summer. Jen, you can send me here anytime you want in the future. I also look forward to another great conversation on PRI Integration of I and I concepts with those who want to rest and relax with models of activity that include sleep, breathing, life enhancement programs and spirituality, with Maria DelliVeneri ATC. Maria, it was so great to get to know you better. Thank all of you for your pursuit of PRI integration in your ‘musculoskeletal’ worlds.